Like spreading ink, dark centers harmonize with vibrant-colored petals. Like spreading tattoo ink, dark centers harmonize with vibrant-colored petals to make a head-turning combination unlike anything we’ve seen. Well suited for pairing with dark-purple flowers such as ‘Black & Blue’ salvia. 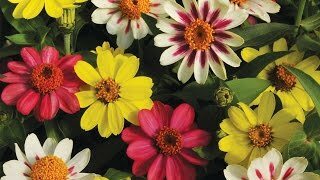 For the best results, grow these beauties in pots, where their originality is sure to leave a mark. Vinca, Tattoo Raspberry is rated 3.0 out of 5 by 2. Rated 5 out of 5 by Markman from Best Performing Vinca Ever! I have been impressed with normal vinca's ability to thrive in the summer heat, its deer resistance, and abundance of flowers, but this series just wowed me. 18/20 seeds made it to the containers and once they started blooming, they were the last plant to be doing so in my garden. I've done residential landscaping for decades and I will always include this series. I will be starting it a bit earlier this year, it took all of 7-8 weeks to start blooming. Rated 1 out of 5 by ann63 from No plants Bought a package of these seeds but no plants ever came up...very disappointed.